To reserve your lunch or dinner use the form on the right. Please note that this booking option is not valid for reservations at the bar. Horrible experience. The food was overpriced and the staff was extremely rude. Would not recomend. Fine dining and great atmosphere. The terrace is amazing and the staff very welcoming and attentive. I would definitely recommend Terrazza Gallia for a romantic dinner or a business lunch. Excellent food. I really enjoy it. Really small portions but very tasty! The food was exceptional; we both had the "Mediterraneo" tasting menu with the accompanying wine selections and I think it might qualify as the best meal I have eaten in 26 years in Milan. Great tastes, complementary textures, visually attractive, imaginative. Impeccable service. Attentive, polite and welcoming staff. Worth their 5-star rating and more. Incredible experience both in the restaurant and bar. The food was absolutely amazing and the drinks were to die for. Thank you so much for completing our visit to Milan. We will be back and we will stay in your hotel solely based on the service we received. This has made my evening/night and completed my birthday celebration and final night in Milan. Thank you. 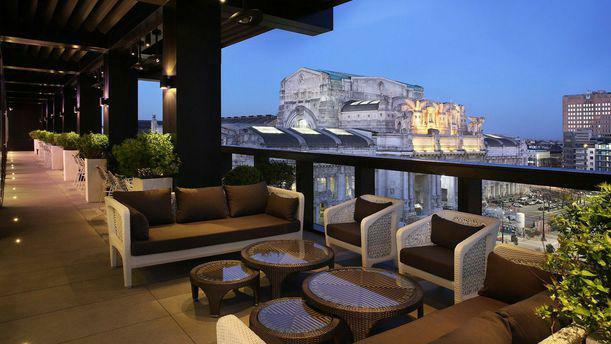 Brilliantly decorated restaurant on the 7th floor of Gallia Hotel with panoramic views of Milan. The menu has a limited choice of contemporary food. There’s no any simple mixed veg salad on the menu, but they will arrange it on request. We chose 2 mixed salads which were OKay. For the main courses we had Paccheri with tomatoes/basil and Parmiggiano and the other one was Ravioli stuffed with fish. Unfortunately both were unbearable. Paccheri was too much “Al dente”: we could even feel some wheat flour inside despite abundant cheese sauce on the plate bottom. Ravioli came black (colored with squid ink) with bouillabaisse sauce. The stuffing was a minced fish.Fish taste dominated the course too intensively so I felt like I was eating some raw fish without any pasta. Fabulous dining - creative visual cuisine, wonderful flavors, substantial surprise in preparations and flavors. This is a treat - well worth the splurge! The food was tasty but cold. Ambiance lacking. Thank you very much Terrazza-Team for a incredible dinner with the best food i ever had and the most excellence waiter in the world: Enrico. Grazie Mille. Not familiar with Italy cruising, tried chef’s menu (75 euro). Nice combination with a variety of cruising across Italy.